I’m not sure how to categorize this recipe. It’s a little bit sweet, a little bit savory, it’s the size of a muffin and the texture of a sponge cake, it’s moist, it’s herbal, it’s terrific dunked in coffee or tea. 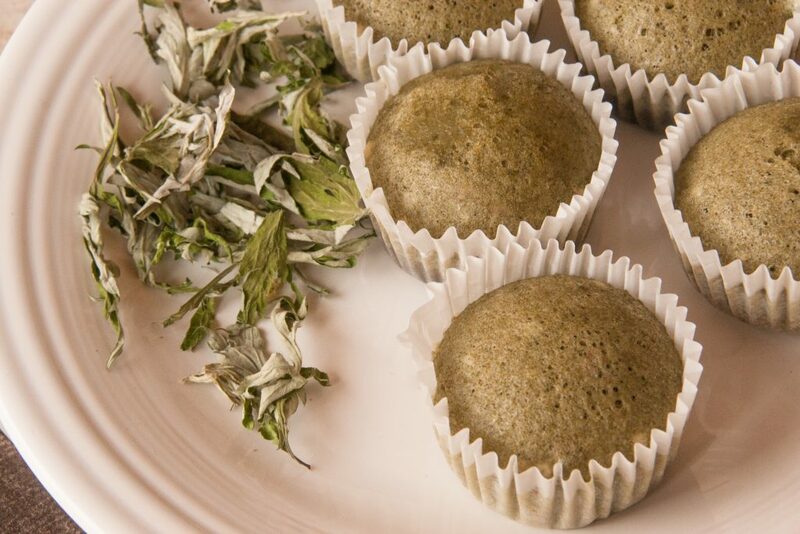 Mugwort steamed buns can be served for breakfast, lunch, or dinner, and any snacking opportunity in between. Mugwort isn’t a traditional culinary herb in the U.S., but in Asia, cooks appreciate its unique flavor. In Japan, it’s known as yomogi and is used to flavor and color mochi, rice cakes, and steamed buns. In Korea, mugwort is known as ssuk, and it’s used in noodles and soups. The flavor of this herb is reminiscent of sage, with a touch of vanilla, and a hint of sweetness. Hard to imagine? You’ll just have to taste it for yourself. Fortunately, mugwort is a common and aggressive weed in many locations, and you should have no trouble finding enough to work with. This recipe makes 6 steamed buns in a muffin tin. Because the muffin tin must sit inside your sauté pan, you’ll probably want a 6-muffin tin rather than a 12-muffin tin. Grind enough dried mugwort leaves in a spice grinder to make 3 Tablespoons of ground herb. Mugwort takes on a very interesting texture when ground. Unlike many spices, it doesn’t form a pourable powder. Instead it becomes fluffy, like cotton wool. Transfer the ground mugwort to a bowl and add enough water to hydrate the herb. You’ll have to stir it a bit. The ground mugwort is so light that it floats on the water. Once it’s all been hydrated, pour the herb into a strainer to drain. You don’t have to be maniacal about getting all the water out, but let most of it drip through. While the mugwort is draining, combine the egg, vegetable oil, milk, and sugar in a bowl. Add the Bisquick and drained mugwort, and stir to combine. The batter will be thin (like pancakes!) and green. Place a cupcake liner in each opening of the muffin tin, and pour in the batter to 1/4 – 1/2 inch below the rim of the paper liner. Place the cupcake tin in a large sauté pan, and add about a half inch of water to the pan. Cover, and turn the heat on medium-high. Steam the buns for 12 – 15 minutes until they are round and puffy. Check at about 10 minutes to make sure the water hasn’t all boiled off, and if it has, add more to the sauté pan. The buns are ready to eat when you can feel them bounce back from (but not stick to) the gentle push of a fingertip. These mugwort steamed buns are best served warm. Leftovers can be reheated in a steamer or microwave. Thank you for this! I’ve always wondered what to do with such an aromatic plant! The recipe sounds tasty. And I especially appreciated the ideas on how other cultures would use the herb – so interesting! Thanks, Valerie. My house smelled so wonderful this summer as I dried batch after batch of mugwort. Better than any perfume!